I recently discovered the website of designer Erika Hendrix and fell in love. I ended up spending nearly an hour browsing her lookbook because I knew I had to have one of her fabulous designs, but had the hardest time deciding on a fav. In 2005, Erika created her own independent fashion label called Erika Hendrix, and boutiques all around Germany began carrying her line of apparel. Her most recent foray into the fashion world was during Paris Fashion Week Spring/Summer 2010. All of the items on Erika’s website are personally designed and handmade by the designer herself, using 90% natural fabrics and materials, such as cotton, linen etc. I picked up the “big tube scarf” and I can’t wait to wear it with my brown tweed cropped jacket. I’m filing this find under “In My Closet” and “My Wish List” because although I have the beige scarf, I still want one of everything from her amazing lookbook. I tweeted Erika to let her know how much I like her shop and she offered my readers a promo code. Enter CELEBRITY at checkout to save 15% on all orders over 50 Euro from now until December 15th. Follow her on twitter at @ErikaHendrix. I’m such a lucky girl. Handbag Heaven contacted me about hosting a giveaway on my site (coming soon) and also offered to send me the handbag of my choice. How cool is that??? Lately, I’ve been turning down the color in my closet for fall, but felt the need to lighten things up a bit (a la Erika Hendrix – right pic). Sometimes, I like to dress up in head-to-toe neutrals, and thought the Tara Accordian Pleat Satchel would be perfect for my pretty in pastel days. I love the pleats that make up this handbag. I love pleated anything and everything right now. This bag is made of a faux leather material that is far more durable than the real deal. The interior is lined with the Ebisu signature floral printed fabric and the knotted twists on the oversized strap really add a unique touch. The tote contains exactly the compartments I need – a zippered pocket on one side opposite two small open pockets for my lipgloss and cell phone. The handbag is finished with a magnetic snap closure. 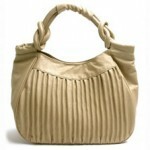 Handbag Heaven was nice enough to take this pleated tote from my wish list to in my closet! So fun! Love it! A couple of months ago I won $20 Bevello Bucks in a contest hosted at the Bevello.com blog. I knew exactly what I was going to cash them in on… everyday leggings! I have liquid leggings and sequin leggings, and now that I am hooked on this trend, I knew I had to have some super comfy everyday basic leggings. The Midnight Black Lounge Leggings from Bevello are so freakin soft. They are 96% rayon 4% spandex, so they have the silky feel of pantyhose, but without the cling and super thin material. It’s rare to find anything that is comfy AND stylish, and these are both to the extreme. I love to be a bit stylish when I go to the hairdresser – I guess I wanna match the cut I’ll be walking out with. I wore these leggings with my shredded tee and ALDO black ballet flats and loved the look. It was super stylish, yet felt as though I was wearing pajamas. This was the best $20 purchase I’ve made (won) in a long time!!! LOVE! 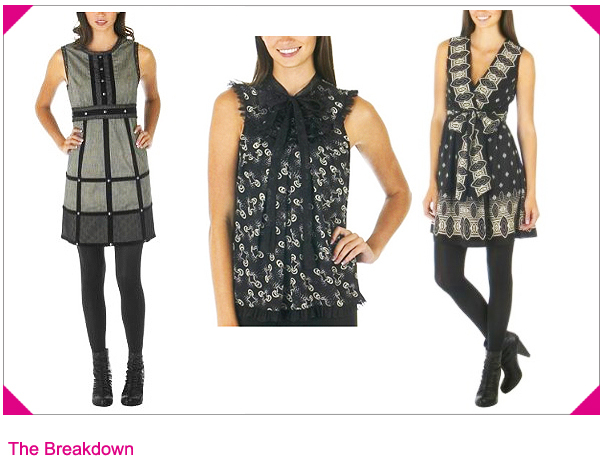 A few months ago, I blogged about the Gossip Girl inspired affordable fashion line that Anna Sui was designing for Target. On September 13th, the line was launched on Target.com and the entire collection sold out within 24 hours! Luckily, I was able to get the few pieces above, but I want more! In particular, I need to add a bit of color to my “personal Anna Sui collection” (I love the way that sounds), and the blue Floral Metallic Jacquard dress is next on my “to-get” list. Target has restocked the majority of the the pieces and they do not expect them to last long. I cannot tell you how exciting it is to have an Anna Sui label in my closet at a fashionably affordable price. The first dress above is my favorite (resembling her high-end designer collection), however the second dress is Anna Sui and it’s silk… need I say more! 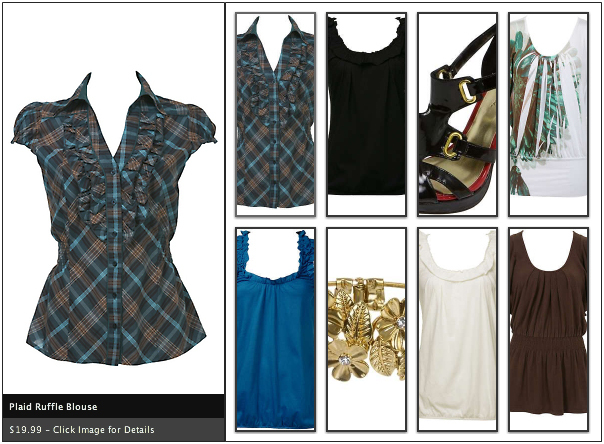 ♥ Spend $50 in Women’s, Get Free Shipping at Target.com thru 10/03. If you follow my blog, then you know that the majority of my closet comes from Charlotte Russe . They have amazingly high quality compared to the other affordable fashion shops, yet their prices are as good, if not better. Their apparel, footwear, and accessories are right on trend and I am able to choose from a great selection for work or play. My latest find is the Bu from Malibu Skinny Jeans . The quality is so great that there is even a hidden backing behind the frey so that they survive the washer and dryer. When skinny jeans came out a couple of years ago, they were skinny because they were so freakin TIGHT. They created a massive muffin top and were so unflattering. The skinny jeans from Charlotte Russe fit in the waist as they should, and are perfectly tapered making for a super comfy fit. I love to wear skinny jeans on rainy days with ballet flats because they are perfect for jumping over puddles – you don’t end up with wet jeans from the knee down. The weather outside is frightful again today so I’m wearing my skinnies, an oversized tee, gold ballet flats, and the full frontal french braid. It is possible to be cute on rainy days if you work with the weather instead of against it. 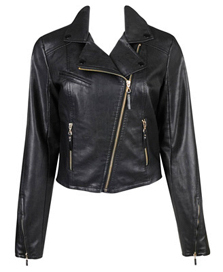 Just returned from a trip to Forever 21 and fell in love with this Faux Leather Moto Jacket. The fit and the quality are amazing. The jacket is as heavy as a real leather jacket and somehow it smells like leather. It’s fully lined and I love the gold hardware in particular, the diagonal zipper. I plan to wear it with my skinny jeans, a long white basic tee, and my black Buckle Booties . If I get the nerve, I may model a few of my fashionable finds soon. I was so excited when I discovered these Steal the Real pumps that I ordered them immediately! The Real is a Jimmy Choo cut out bootie that was available at Bergdorf Goodman and originally retailed for $950. 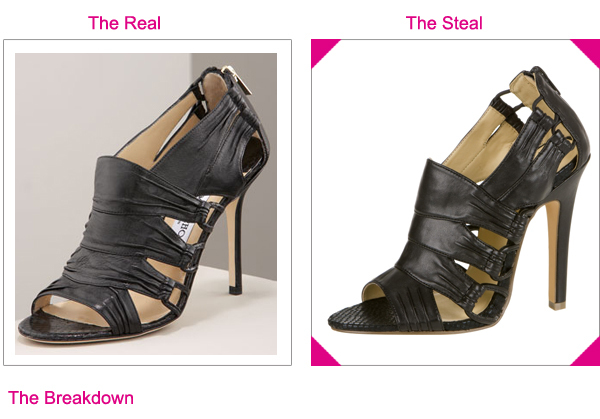 The Steal is identical in style and may be found at Charlotte Russe for $26.99 for a difference of $923. 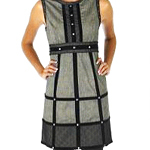 They are available in black (shown above) and brown. I admit it… I went a little nuts at the CharlotteRusse.com super sale. I couldn’t help myself, but I have an excuse, in fact I have several. First and foremost, I love Charlotte Russe. They have great selections at amazing prices and I have been waiting for them to have a sale that I couldn’t pass up. Their save 25% off site-wide promo on Monday was “that sale”. Secondly, I really need work clothes in a bad way. I work in a business casual office so I love taking cute tops and mixing them with wide leg pants, a cropped jacket, and some accessories. As you can see from my purchases, I’m addicted to black, white, and cream, so the blues were my attempt at mixing a bit of color into my wardrobe. The striped tops and tee I will layer with a tank and wear on casual Fridays. The Rugby Striped Top is from our Taylor Momsen look for less. This post goes out to my twitter bud, @fabfrugtrina. We went on a virtual twitter shopping spree together, tweeting links to each other while adding items to our shopping cart. The very next night I went crazy at the Urban Outfitters sale… but I’ll save that for another post! Update: I just got my spree in the mail and based on everyone’s response at my Facebook page, the Flower Dolman Top is the fan favorite. I decided to wear it today for casual Friday and I love it!